This article provides as thorough a discussion of the US banking system as I can manage in less than 3,000 words. The Fed is trapped. The current era of Keynesian economic management will run out of time. But one cannot say when. The golden years of the past decade will not last. A portfolio that limits leverage, is diversified, and seeks ownership in sound companies is likely to provide a successful defense. There are many authors and commentators on Seeking Alpha who understand the American banking system. There are others who do not. This article provides an overview of its functioning and recent history, and my perspective on the likely outcomes and implications. I wrote it so I can refer to it in other articles, without having to devote half the article to explanations. And it turns out that understanding does lead to some insights for portfolio strategy. I hope readers find it informative and useful. We start with the simple story. The Fed creates the Monetary Base, out of thin air. One way to do this is to have the US Treasury sell bonds and to place the proceeds in the Fed’s bank account. The bank is legally allowed to loan a fraction of these funds, which we will take to be f= 90%. The recipient, who pledges collateral for the loan, then deposits the funds back in the bank. We speak of only one bank for this example. The actual flow of funds is across many banks. At this point the bank shows deposits equal to 190% of the initial injection of funds by the Fed. But the cycle is not done. The bank can loan out up to 90% of the funds from the first loan. And up to 90% of the deposit that results from that loan. And so on. The final, maximum deposits resulting from this process is the inverse of (1-f ), which is 10 times the initial funds. This system is called Fractional Reserve Banking. Figure 1 shows a flow chart that illustrates the process. Figure 1. The process of money creation begins when the Fed creates money from nothing. After that a sequence of deposits and loans expand the amount of money by a large factor. There are some people who consider Fractional Reserve Banking to be morally wrong. In one respect, I agree. Bank depositors are told that they can withdraw their funds unconditionally. This is in fact not true, as many have discovered during bank runs. In my view, this is a problem of disclosure and contracts, not basic morality. For historical reasons, and with government help, the underlying falsehood came to be commonplace. As an example of an alternative, in the 1980s I had some gold in a Swiss bank who I paid to hold the physical gold as mine. Some also object to the creation of money by loans, based on the historic definition of money. This historic definition of money was that it must be a store of value, a medium of exchange, and a unit of account. I see no reason why all three must be present, just to satisfy tradition. In fact, those loans are based on collateral. What they really represent is the monetization of economically valuable assets. This has upsides and downsides, as Gary Gorton discusses quite well in his book “Misunderstanding Financial Crises…” Even so, to my mind having money in the economy in proportion to the economically valuable assets seems sensible. There are others, some of whom I respect, who consider Fractional Reserve Banking unwise. My response on that point is that the horse has left the barn. As Gorton describes, people and firms who want to exploit economic opportunity will seek ways to monetize their assets. In this day and age of shadow banking and cryptocurrencies, trying to suppress this will only drive it to places that make it harder to monitor. In sum, our Fractional Reserve Banking system starts with the creation of a Monetary Base by the Fed. This is followed by the creation of the money supply by means of borrowing from banks by participants in the economy. M2 was once all the money easily spent in the economy, but it seems dated to me. I can write a check on my Fidelity account and go sell investments to cover it, all in a few minutes at negligible cost. Only 20 years ago, this would have been a far more expensive and much less convenient process. As investments become more liquid and accessible, the measurement of money becomes much more complex. Prior to the Great Recession, the Fed has not routinely used direct control of the monetary base as a policy tool. Instead, it has manipulated the “discount rate”, which is how much the Fed charges member banks to borrow, when needed, to maintain their required reserves. This turns out to control short-term interest rates, but the rest of the yield curve develops from complex market mechanisms. Figure 3 shows the ratios of some of the curves in Figure 2. First, attend to the trends before 2009. 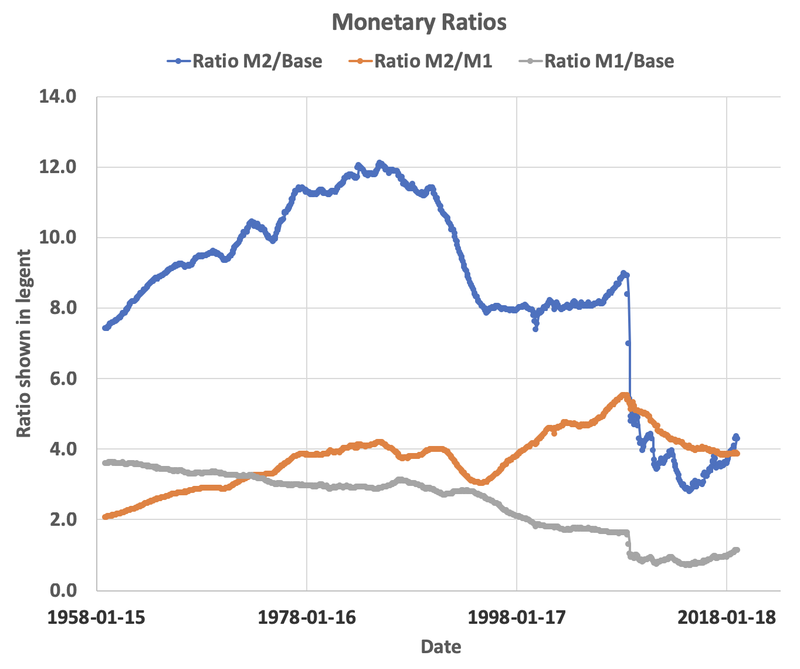 The ratio of M1 to the Monetary Base steadily declined. I suspect the reasons are related to the discussion in the previous paragraph and to credit cards. The need for real ready cash and checkable deposits at banks has been dropping for decades. Figure 3. Ratios of monetary aggregates over time, prepared by the author based on the data underlying Figure 2. The ratio of M2 to the Monetary Base is more interesting. The simple story above suggests that this should be fixed at the inverse of (1-f ). Even before 2009, this curve reveals some limitations of the Fed. During the 1950s, individuals and business were cautious and unwilling to expand their debt to the extent enabled by the Fed. Only as memories of the Great Depression faded did this ratio work its way up above 10. Yet writers then as now often assumed that the money supply would always be near its maximum possible value. This became true during the high-inflation years of the late 1970s and early 1980s. Among other aspects, leveraged investments in inflating assets is a good way to make money in such times. The monetary ratios stayed steady through the 1980s, even as the aggregates increased by about a factor of two. After the recession of 1991, M2 stayed flat for a few years. There were quite a few business failures and defaults, and lending did not pick up despite a steady increase in the Monetary Base. The Savings and Loan crisis no doubt played a role in this. Since then, M2 has been increasing at a steady, compounding rate. This appears as a straight line on the log plot of Figure 2. I find it notable that the increase of M2 appears to have been unaffected by the Great Recession. This is a sharp contrast to the Great Depression, in which it collapsed. Fed supporters consider this a major victory in how the Fed responded to the Financial Crisis. My own estimate is that they are probably right. In the long run, money creation by the Fed is inflationary. All else being equal, such money creation translates to a corresponding increase in the total amount of money in the economy, and this in turn translates into higher prices. Milton Friedman argued convincingly from data that this was the main story throughout much of the 20thcentury. But all else often has not been equal. The simple story of money and prices is this. If people spend money at the same rate, the prices change depending on the difference between increases in economic activity (e.g. GDP) and increases in the money supply. If the money supply increases more slowly than GDP, then the result is deflation. It is often claimed that this was the average story in the latter part of the 19thcentury. One element of the actual story, in an economy with Fractional Reserve Banking, is that changes in debt typically dominate over economic changes. Deflation can result from widespread contraction of credit, via bankruptcies or debt retirement. Looking back a few decades in Figures 2 and 3, economic participants in the 1950s refused to borrow as much as the Fed enabled. Price inflation stayed flat. Even so, the notion from Keynesian economics, that the Fed can boost economic activity by forcing interest rates down, worked well enough in the 1950s and 1960s. By the 1970s, though, Keynesian economics failed. The money supply increased and supported the inflationary spiral of ever-increasing wages and prices, even as economic growth stagnated. Interest rates refused to go down when the Fed eased. Everyone was borrowing to invest with leverage in inflating assets. Since the end of inflationary expectations, sometime in the 1990s, Keynesian economic prescriptions have begun working again, though perhaps not so well. The Fed responded to the Financial Crisis by greatly increasing its assets. It bought a lot of toxic, mortgage-backed securities. This took them out of circulation so they quit causing problems for financial institutions. The Fed also bought a lot of Treasury Notes and Bonds. The Monetary Base more than quadrupled. In terms of the simple story above, we should have seen massive price inflation. When this began, a friend of mine then in his 70s immediately liquidated his bond ladder, expecting immediate inflation. A couple years later, another friend who hangs out at times with the Austrian economists at George Mason conveyed that they were flabbergasted by the lack of an inflationary response. My response was that they had neither attended to history nor thought through the sequence of events needed to translate easing to inflation. One thing those economists had not figured out is how tricky the Fed was. It did not immediately inject those new funds into the economy. Instead it created a supplemental financing account, which held hundreds of millions of dollars, to hold some of the funds. Only gradually were they rolled out to the banks. As Figure 4 shows, even then the banks did not do anything with most of that money, for a long time. 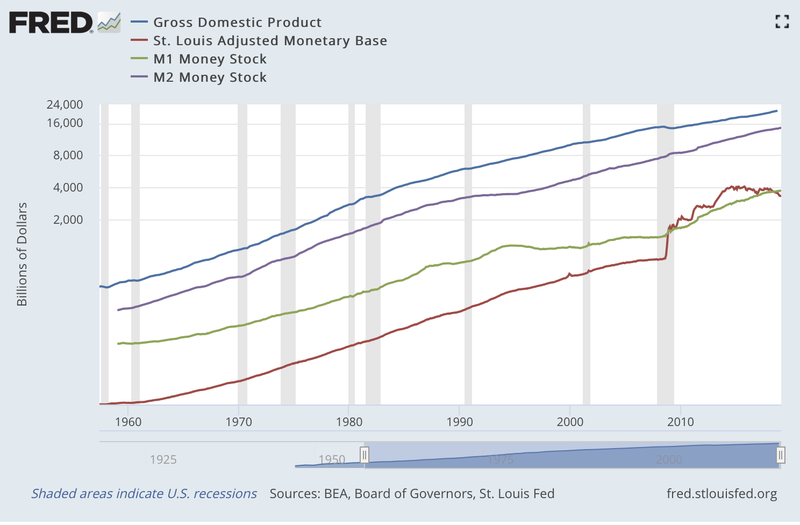 This is why, in Figure 3, the Monetary Base rises above M1. The money was available, but it was not used. The rate of increase of the money supply did not acelerate, and price inflation did not explode. Figure 4. 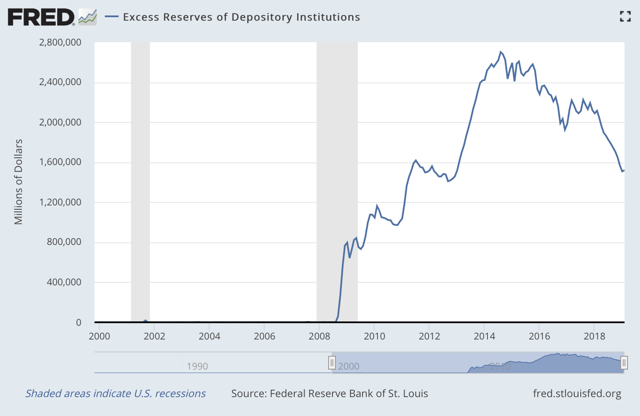 Excess reserves, above required legal minimums, held by banks. In sum, the Fed was a good magician. It removed a bunch of toxic assets. And it stood by with a lot of (unused) liquidity for banks. In the face of the Financial Crisis, the Fed did its job. It enabled the financial system to begin functioning again and to keep functioning. Only recently has M1 crept back up above the Monetary Base. Gorton also points out that no government has ever allowed its financial system to collapse, even when it was explicitly illegal to save it. In addition, the governments have generally recovered the funds supporting the bailout, often with a nice profit. Quite a few commentators attribute the increases in value of investments during the past decade to the liquidity created by Fed easing. Randall Forsyth of Barron’s often makes this argument. In their view the low interest rates generated by the Fed have enabled bubbles to develop in financial assets. I find this hard to credit in the stock market, as it does not seem very overvalued. The case seems better to me for other activities driven by easy credit. Figure 5. 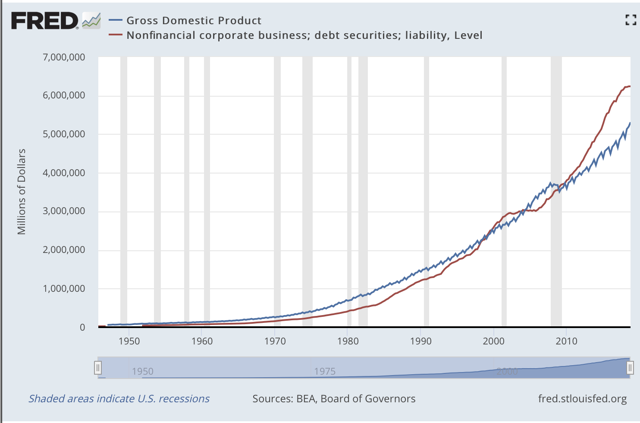 Comparing corporate debt and Gross Domestic Product. One thing that is clear, as Figure 5 shows, is that corporations exploited low interest rates to greatly increase their debt. (Households did not. Household debt to GDP actually dropped during the past decade. FRED has a series. Look it up if you want to.) Whether the corporations used that debt to expand production or to buy back their own stock, the expansion has moderated recently. I see lots of anecdotal evidence of active deleveraging now. I don’t believe that the future is uniquely predictable. You can find many specific predictions from other Seeking Alpha authors, if that helps you sleep. A few things do seem clear to me. The Fed will continue its recent Keynesian path until it fails. Whenever the next recession arrives, we will see low discount rates and likely more expansion of the Monetary Base. In my opinion, this will stave off another Financial Crisis but may or may not prove stimulative. As others have remarked, the Fed is trapped by politics. It will not be able to get out of expansionary reactions until eventually these lead to a different kind of crisis. The idea that we would enter a period of severe deflation, like Japan did, has some advocates. Certainly, if enough businesses either strongly deleverage or go bankrupt, the collapse of the money supply will be deflationary. Substantial deflation would be disastrous for the homeowning middle class; I would expect the Fed to respond by taking extreme measures with the money supply. Even so, the more important aspect of the response to a deflationary recession would be that the US system does not usually prop up zombie banks and zombie firms. Once the ones that need to fail do fail, growth will soon resume. These events, however they play out, will have one definite outcome. The Monetary Base, and thus the potential for price inflation, will continue to strongly increase. Eventually this price inflation will occur. One can say a few things about this. When it happens, it will be a complete surprise to almost everyone. In my opinion, it will happen during a period when firms are taking on debt to expand actual production and find that they need to bid higher for workers. The newly rewarded workers will in turn take on more debt based on that new income. The firms will raise prices and off the spiral will go. The ongoing reshoring of supply chains, in response to the Trump trade noise and other factors, is one element that makes an inflationary outbreak easier. Could the outbreak be beginning now, while we all await the next recession? Maybe. Whatever is most anticipated in the economy tends not to happen, and this next recession strikes me as the most anticipated recession of all time. 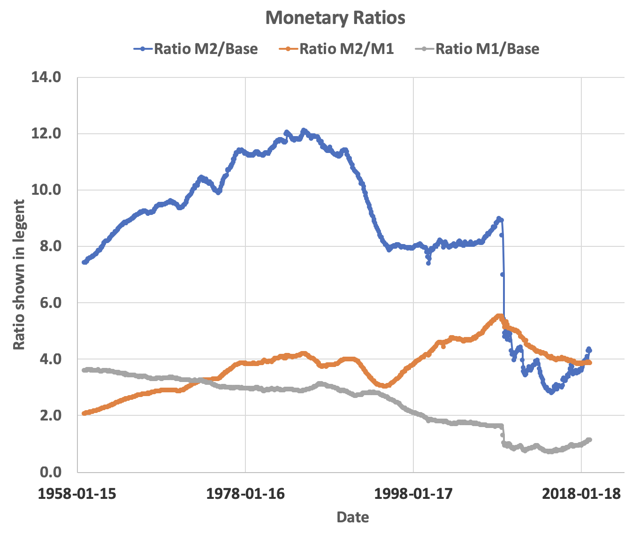 The ratio of M2 to the Monetary Base (Fig. 3) has been rising. I would be surprised if the inflationary outbreak were now, but I expect to be surprised whenever it happens. The most important issue for investors will be how quickly interest rates respond to the resurgence of inflation. Here we sit, anticipating a recession that edges on deflation, and fearing an outbreak of inflation that is almost certain to eventually occur. (I’ve discussed the problem of protecting oneself from long-term inflationary effects elsewhere.) What to do? In a deflation, the value of assets decreases. This can easily wipe out the equity in highly leveraged investments. Assuming a recession is part of the story, some such investments, such as mREITs, would suffer doubly between decreasing asset value and mortgage defaults. While the best preparation for deflation is to hold cash or hard assets, this is purely defensive. When the inflationary outbreak comes, holding cash or long bonds will be a good way to lose real value. For leveraged investments, the story will be complex, because interest rates will increase. The value of an income generating asset decreases as interest rates rise, while the value of a real asset like property increases with inflation. There is a good chance that highly leveraged investments will fail. Investments in income-generating assets whose value will inflate, even with modest leverage, may do well. Beyond that, as the Fed eventually fights the inflation, there will almost certainly be a period when the yield curve inverts strongly and repo rates exceed the yield of mortgage-backed securities. This could easily drive a lot of mREITs bankrupt. Similar developments have occurred at least twice before the Great Recession. One of these cases was the Savings and Loan crisis that began in the late 1980s. And quite a few mREITs did go under during the Great Recession. One approach that may survive all these possibilities is this. Hold ownership, one way or another, in sound companies with a high likelihood of surviving whatever comes. REITs seem attractive in this context. So do the Dividend Aristocrats and similar firms. Diversify broadly, since you cannot predict which sectors will suffer disproportionately. Limit highly leveraged investments to an amount of funds that you could afford to lose. The past decade has been a golden age for investors. This has been especially true of highly leveraged investments, such as mREITs and highly leveraged BDCs. Interest rates have been falling to flat, until recently. Inflation has been moderate at most. The economic expansion has continued. This will not last. A portfolio that limits leverage, is diversified, and seeks ownership in sound companies is likely to provide a successful defense. Additional disclosure: Additional disclosure: I am not a financial adviser or a tax advisor, but am an independent investor. Any securities or classes of securities mentioned are not recommendations.